Hearing this week’s song of the week today brought to mind a discussion I had with another writer on Facebook a few weeks ago. 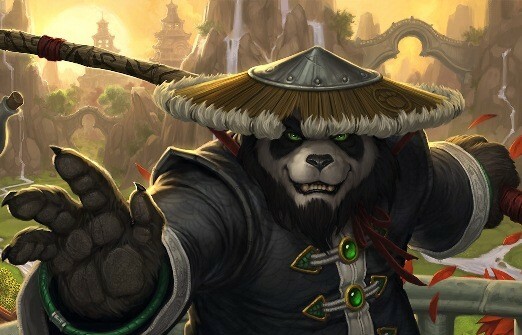 The release of World of Warcraft‘s latest expansion was nigh and, as many of you know, it was introducing the pandaren as a playable race. The pandaren are basically kung-fu pandas, mystical shaolin-style monks, and their homeland is based heavily in eastern cultural tropes. (They also predate the Kung-Fu Panda movies by several years). Now, I haven’t played WoW in many years, but my son still does occasionally, and I’d watched him play some of this content during its beta testing. It was fun stuff. the pandaren had a lot of charm and character, their abilities were clever and different than the stock WoW fare, and the world-building for their lands was gorgeous and epic in its scope. Anyway, this writer snorted derisively at any grown-ups out there who were actually looking forward to playing panda warriors. Why? Because pandas are cute, naturally, and only children could conceivably want to play such cute creatures. I challenged him on it, because not only do I see the pandaren as neither more nor less intrinsically ridiculous than elves, dwarves, gnomes, or any of the other fantasy races you can play in WoW and similar games, but I think a fantasist attacking other people’s fantasies rather unbecoming. This writer makes his living writing face-to-face roleplaying games in which the players pretend to be monsters (as indeed I used to when I was a writer for White Wolf Games). Quite a few people would consider that sort of thing childish. I just have an innate negative reaction to arguments that denigrate the tastes of others in ways like calling them “childish,” when as far as I’m concerned pretending to be a kung-fu panda is no more ridiculous or childish than pretending to be a stalwart shaman cow. Or a magical mystical mummy, for that matter. I *completely* accept that the pandaren might be considered cool by players of a given age range, those of commensurately immature taste, and those who engage them as part of spending time with their kids, and I hope you’re right that those folks enjoy playing the hell out of it. But it’s not for me, play-wise, nor for the adults with whom I game on the regular…Pretending to be a bouncing anime panda-person may not be more ridiculous than pretending to be a shambling mummy, but it *is* more childish, and there’s just no way around that. Note the pointless zealotry, the refusal to accept that any mature adult might be able to enjoy playing these fantasy creatures, while playing other fantasy creatures is presumably quite adult. Pandaren might be enjoyed by players “of a given age range” or “commensurately immature taste” or those playing alongside their children. He couldn’t just take a reasonable step back and think, “Maybe an adult might enjoy this simply because it’s fun and they get a kick out of it.” He had to insist that an adult who liked this sort of thing was not the proper sort of adult at all. To personalize it, I think the pandaren are cool, and were I still playing WoW I’d be looking forward to playing one. To therefore say that only people of a certain age range or “commensurately immature taste” can find them cool is insulting. I seriously doubt my tastes are any less mature than yours, and in fact the tendency to argue the “maturity” of such things seems to me an immature one. But, to be agreeable, I’ll cede your point that making believe you’re a scary monster is much more grown up than making believe that you’re a panda-esque warrior. Because what the hell. Don’t try too hard to be a grown-up, folks. It’s something that happens naturally in its course, and it has nothing to do with whether you can still have fun or not. This entry was posted in Favorite Posts, Gaming, Life, Songs & Music, Wisdom and tagged Americana, country music, fantasy, folk, folk rock, growing up, James McMurtry, Life, Music, pandaren, roleplaying games, Song of the Week, songs, Songs & Music, Tim Byrd, values, videos, World of Warcraft, WoW. ← The Spider Is Dead! Long Live The Spider! Yup, that’s silly. I was in a fantastic one-shot at a game convention where our (all-adult) group played ninja squirrels. The ninja squirrels had a complex background based in a previous group’s collaborative world-building/history-establishing process and subsequent long-standing campaign as well as actions of an on-line group that played the 18 gods of the world, who were constantly struggling for influence. Playing out the results of this history at a crisis moment for the race was fascinating, as was knowing that our own actions would influence the ongoing campaign world and struggles of the gods. It’s not that difficult to take something merely “cute” and make it into something complex, nuanced, and enjoyable by adults. It’s silly for those in the gaming world to try to stratify status within that arena through the sort of criticism you describe.